Looking For Higher Interest Rates on Bank FDs? Read This! Home > Financial News. Simplified. > Looking For Higher Interest Rates on Bank FDs? Read This! India's financial sector might be in the news for all the wrong reasons these days, but there've been a few bright spots. For example, the latest credit growth trends. 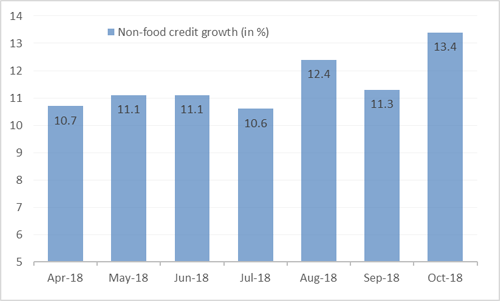 In August, the non-food credit growth touched a 4-year high. After experiencing a mild drop in September, many experts had believed it was just a one-off observation. Chart: Faster Credit Growth: A ray of hope? Is the Indian economy finally coming out of a prolonged stagnation? Yes, it’s been the fastest growing economy on paper, but the ground reality has been relatively discouraging. Factors such as the increasing Non-Performing Assets (NPAs), fragile recovery in the capex cycle of corporate India, the average performance of manufacturing industries, and the lacklustre job market have made India’s GDP growth numbers less convincing. Nonetheless, the situation might change with improved credit growth, as it often follows with a pick-up in the private sector capex cycle. What’s the reason behind such a high credit growth? And more importantly, will the retail investor benefit from this trend? Credit disbursement to the productive sectors of the economy such as infrastructure, engineering, food processing, textiles, and chemicals, among others is rising. The liquidity crunch has forced some Non-Banking Finance Companies (NBFCs) to sell their credit portfolios to banks. Meanwhile, the credit assistance to agriculture, services industries, professional and Micro-Small-And-Medium-Enterprises (MSMEs) has steadily improved. After the IL&FS fiasco, corporates have been finding it difficult to raise money directly from the market, which also reflects in the rising credit growth. What’s the result of higher credit growth? Since there’s a liquidity crunch in the system, the pace of deposit growth is still in higher single digits for most of the banks. In such a condition, banks are disbursing more than what they are collecting through deposits. Hence, the interest rate hikes are rather out of compulsion to attract more deposits. 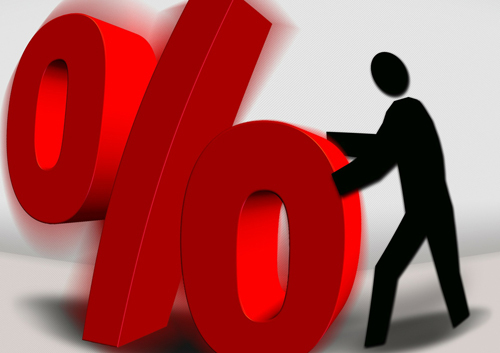 In the recent past, prominent banks with nationwide presence have hiked interest rates on FDs. Table: Will interest rates on FD rise further? Will interest rate go further up? At the fourth bi-monthly monetary policy review, the RBI lowered the inflation projections for FY 2018-19 and those for Q1, FY 2019-20 from the August resolution. The RBI’s Monetary Policy Committee(MPC) reiterated its commitment to containing the 4% headline inflation target for the medium term. According to its projections, retail inflation is likely to remain in the range of 3.9% to 4.5% in the H2 of FY 2018-19 and approximately 4.8% in Q1 FY 2018-19. For October 2018, the CPI inflation data came in at 3.31%. But it looks unlike that RBI would budge and reduce rates in the fifth bi-monthly monetary policy for 2018-19 (scheduled on December 5, 2018); it would wait for certain definitive signals. In fact, citing risk to the inflation trajectory the RBI has changed the stance of the policy to ‘calibrated tightening’ from ‘neutral’ citing. Inflation trends and interest rate trends suggest that investors of fixed deposits are receiving decent inflation-adjusted (pre-tax) returns. If interest rates go up from the current levels, and as projected inflation remains 4% or thereabouts, investing in fixed deposits will become more attractive to investors. Time to redeem equity mutual funds and invest in fixed deposits? Many investors are confused at this juncture. Despite investing in mutual funds through Systematic Investment Plans (SIPs) and preferring direct plans, their investments are generating negative returns. If the markets remain under stress for some more time, there’s a possibility that these investors might want to opt out of SIPs and go back to conventional savings avenues-bank FDs. If you’re thinking on similar lines, please remember that investments in equity mutual funds help you generate higher inflation-adjusted returns over the long-term. Right now, FDs are generating positive inflation-adjusted returns, but if inflation continues to rise, tax-paying depositors will soon start generating negative real returns. PS: If you wish to take a calculated risk and invest in equity funds, PersonalFN can help you pick hidden gems or lesser-known funds that are capable of generating big gains for you. PersonalFN has released a report 5 Undiscovered Equity Funds especially for investors like you. These undiscovered funds can help you counter inflation by a substantial margin. Subscribe today!